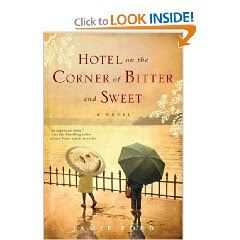 Hotel on the Corner of Bitter and Sweet is the story of Henry, a Chinese boy growing up during World War II. His father is a Chinese nationalist who send Henry to a mostly white school, rather than with other Chinese kids in his neighborhood. He makes Henry speak only in English in the home even though neither parent understands English very well. Henry's father hates the Japanese and makes Henry wear a "I am Chinese" button so that others won't mistake him for Japanese. Henry is ridiculed by his Chinese peers for going to a while school and by the whites in his school. He feels so alone; his parents hardly communicate with him. His loneliness improves a little when he meets Keiko, a Japanese girl who begins attending his school. At first, he stays away from her because of his father's ant-Japanese sentiments. They soon become friends as they realize they have a lot in common. Their friendship blossoms and soon Henry finds that he is always thinking of Keiko and wanting to be with her. Then, the anti-Japanese sentiment in the country increases and Japanese people are sent away to interment camps. Henry's only friend, Keiko, is taken away from him. I loved this book so much. There were chapters from 1942-1945 when Henry was a boy of 13-15 years. These chapters were then followed by Henry in 1986. The chapters went back and forth as we saw Henry as a grown man whose wife just passed away and with a college-aged son. I loved going back and forth in time, and found that when I was reading the earlier chapters, I couldn't wait to get to 1986 and when I was in 1986, I couldn't wait to get back in time. The flip flopping of the chapters was a technique that worked well and kept me engaged throughout. In 1986, in Seattle's Panama Hotel, items were found that had been locked in the basement for 40 years. These items had belonged to Japanese families who'd left them behind when they were taken away. The hotel had been boarded up for 40 years and the finding of the items is what prompts Henry to reminisce about the past. This was a beautiful love story that showed the bitter with the sweet. I probably should just read this. I really should. But something holds me back. I haven't read a review yet that's convinced me. I have this book and have been trying to get to it for months. I'm glad you liked it. It just moved up on my list! Great review. I really enjoyed this touching story as well. Amanda, not sure what's holding you back. I read a few reviews that point out some inaccuracies, but I think some of those have been fixed and were not in the edition I read. I loved it, but you might take a different view. I would say, give it a try. Lula- definitely read it. HOpe you like it. Diane, I'm glad you agree. What holds me back is that I've never been much into books about Asian culture, I don't like books about war or the aftermath of war, and I generally dislike historical fiction. The story sounds interesting, but there are a lot of elements that are just ones that don't interest me, so that's why I hold back. I've heard of this flip-flopping between time periods, like you describe between 1942 and then to 1986, in books. It seems like it would be so engaging. I look forward to reading this as it's on my TBR list. This sounds like another good one. I had heard of it, but I didn't really know what it was about. Will have to look out for it now for sure.